Tooth decay is an infectious disease produced by bacteria. Some people are lucky and don’t catch it, but most people do catch it early in life and then are predisposed to developing tooth decay. We do not yet know exactly how this disease is transmitted, but if you are an adult and you have a history of tooth decay (as most people do), try not to share spoons, glasses, bottles (or saliva when kissing) with small children, and do not put their pacifier into your mouth – just to be on the safe side. This is a factor which we cannot influence. how to stop existing tooth decay from getting worse. Tooth decay is a process which softens and destroys the hard tissues of the tooth. These tissues are called enamel and dentine. Bacteria, feeding on sugar, produce the acid that fuels this process. It is treated by removing the parts of the tooth that have gone bad, and replacing the missing parts with a ‘filling‘. There can be a direct relationship between stress and tooth decay. Stress (feeling upset) can lead to an increased desire to “sweeten” our lives and ourselves. This results in a greater frequency of sugar in the diet. The increased frequency of sugar in the diet leads to tooth decay. It is true that there are many other factors in tooth decay, but this is the major factor and one over which we have direct control. The good news is that you do not need to give up anything! The problem is frequency or the number of times per day that sweet things are placed in the mouth. So we deal with the frequency. The simple secret is to make a decision to leave 3.5 to 4 hours between sweet consumptions (of course, it would be even better to cut out sweets for some of these meals, and only have them as occasional treats). It means that the teeth have this time (4 hours) to recover from the effects of acid produced by sugars. It also means that you automatically cut down the number of acid attacks to 4-5 per day. “This is how I advise my patients. I like to keep it simple and easily understandable. We call this method ‘Fair Play To You And Your Teeth’ because you get what you want and your teeth get what they want! It is fair and even-handed. Have what you want! — 3.5 – 4 hour break — Have what you want! Which foods are best for teeth? Most foods do contain some carbohydrates in the form of sugars and starches, so the best thing to do is to eat sweets at mealtimes, as a dessert, to cut down on the number of times per day your teeth are exposed to acid attacks. If you like fizzy drinks, it’s best to have them at mealtimes, rather than at other times of the day. Use a full-strength fluoride toothpaste (1350-1500ppm fluoride). If you cannot use toothpaste because you don’t like the taste, make sure you at least use a fluoride mouthwash after brushing. If you are at high risk of tooth decay, your dentist or dental therapist can prescribe a prescription-strength fluoride toothpaste (2800-5000ppm fluoride). Put the toothpaste directly onto the toothbrush, without wetting the toothbrush first. That way, you’ll avoid diluting the fluoride. Work the paste right into the bristles of the brush so that it doesn’t all fall off in a big lump when you first put it into your mouth. Spit out the toothpaste after brushing – DON’T RINSE! This may seem counterintuitive (after all, TV ads have been telling us for decades to rinse with a mouthwash). However, if you avoid using water or mouthwash after brushing, the fluoride stays on the teeth, rather than being washed straight off again. It’s much more effective that way. Spit out as much as possible and don’t worry about swallowing the rest. If you want to use a fluoride-containing mouthwash as well, you can do so at other times of the day, in between brushing. It remineralises teeth. Most of the foods we eat contain some sugars (such as sucrose, glucose, fructose, lactose and cooked starches). Bacteria in the mouth (including streptococci mutans) munch on this food and produce waste products which are very acidic, with a pH of 4 or lower. When teeth are exposed to an acidic environment of pH 5.5. or below, a process called de-mineralisation occurs. As the word suggests, minerals are leeched from the tooth, and this is what causes tooth decay. It takes about 30 minutes for the pH to return to normal, and you should avoid brushing your teeth for at least 30 minutes after meals and acidic and/or sugary drinks to prevent damage to the softened enamel. The advice to brush after every meal and after eating sweets, which was popular in the 1970s and 1980s, is outdated. There is an opposite process called re-mineralisation (sort of like tooth decay in reverse), where minerals are deposited back onto areas where mineral content has been lost. This is where fluoride comes in handy. Fluoride ions in your mouth (like from fluoridated drinking water, toothpaste or mouthwash) get deposited onto the surface of teeth in areas where demineralization has occurred. The fluoride ions attract other minerals (such as calcium) which were lost during the demineralisation process. Fluoride protects agains decay. When fluoride itself replaces the kinds of minerals that were originally lost during the demineralisation process, it forms a new type of tooth mineral called fluorapatite that’s actually “harder” than the tooth was originally. Fluoride fights the bacteria that cause tooth decay. New research suggests that fluoride makes it harder for bacteria to produce acid and cling to the teeth. Clean between your teeth once a day (using either floss or interdental brushes), so that plaque (the sticky film which contains bacteria) gets removed from all tooth surfaces, including those that can’t be reached with a toothbrush. Avoid boiled sweets – they stay in contact with the teeth for a long time. 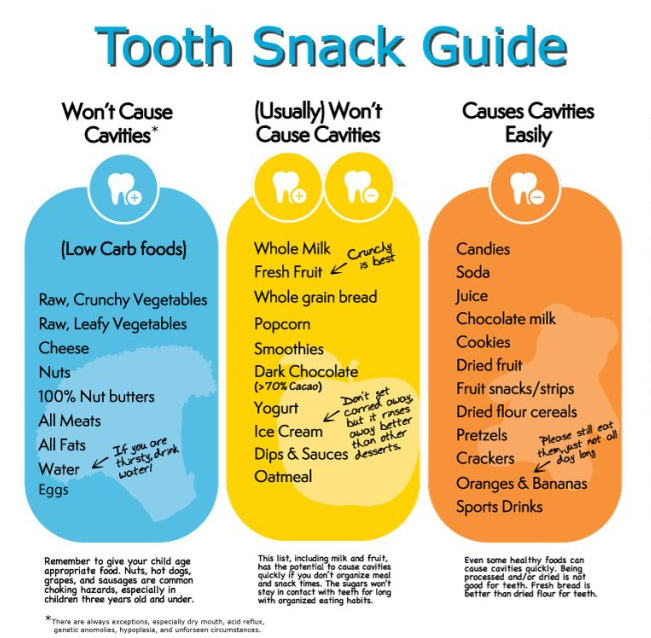 There are many sugar-free alternatives – sweets that have been sweetened with Xylitol can even help prevent tooth decay! Xylitol sweets and gum inhibit the growth of streptococcus mutans, one of the main bacteria involved in tooth decay. Be aware of hidden sugars, especially in soft drinks and fruit juices. Remember that “no added sugar” doesn’t mean that a product is sugar-free – they may contain sugars, or the sugars may be listed as ‘carbohydrates’. Pure fruit juice always contains sugar, as do “low”-sugar options such as Ribena. Soft drinks can be particularly bad for teeth because we tend to drink them over longer periods of time, throughout the day. Choose diet versions instead if you want to avoid tooth decay but can’t cut down on soft drinks. While diet soft drinks can’t cause tooth decay, they can cause acid erosion, so you should try and limit the amount of time they’re in contact with the teeth. This is especially important for children (also, articifical sweeteners may not be suitable for young children – ask your dentist if you’re not sure). Similarly, if you like sweet tea or coffee and drink it throughout the day, switch to sweeteners instead of sugar. Some teas have been shown to actually protect your teeth from decay, especially green and black teas (the same can’t be said for infusions, some of which are actually quite acidic). Tea and coffee themselves do not contain sugar. Water and milk are good choices, and also diluted sugar-free squashes (1 part cordial to 10 parts water). Fruit are very healthy, but they are also acidic and contain sugars. Although they’re not as sticky as some other sweet things, you shouldn’t eat them as a snack during the Recovery Time on a regular basis. If you do eat them as a snack, try to eat something alkaline (non-acidic) afterwards such as cheese. Savoury snacks are better, such as nuts, raw vegetables, or cheese. Using sugar-free chewing gum after meals can help prevent tooth decay, because it makes your mouth produce more saliva. The extra saliva helps to cancel out the acid in your mouth after eating or drinking. A dry mouth also increases the risk of tooth decay. Saliva is very important in the fight against tooth decay. It contains a number of ingredients which help to fight the bacteria that form dental plaque and cause decay and gum problems. There are certain medical conditions (especially Sjogren’s Syndrome) which can cause very dry mouth. Radiation treatment and damage to the salivary glands are other causes. Also, certain drugs including tricyclic antidepressants, antispasmodics, some anti-psychotic drugs and HAART for people living with HIV can all cause dry mouth. Some women also experience dry mouth as they are going through the menopause or taking Hormone Replacement Therapy. Ask your doctor if you are taking medication and it’s causing you dry mouth, to see whether the medication can be changed. There are many products which can help with dry mouth. The main manufacturer (in the U.K. at least) is Biotene, but there are many artificial saliva products, lozenges , gels and sprays which may help. Ask your dentist or pharmacist for advice and recommendations. Make sure that any lozenges or boiled sweets you use to alleviate dry mouth are sugar-free. It is important to keep sugary foods and drinks to mealtimes only. Your dentist may also want to prescribe a toothpaste with high fluoride content. Avoid mouthwashes which contain alcohol, as these can dry out your mouth! “Decay is a dynamic process, so far as we’re aware, the surface of teeth is constantly in a state of demineralising/remineralising. Decay happens when something tips the natural balance too far in the demineralising direction. Since you need bacteria/fermentable carbohydrate/susceptible teeth all to be present for decay to progress, then changing the balance of one of the three will change the decay progression.